The guest house is run by a non profit organization called Roulopa (it reads „drive at a walking pace“ in French). It is available to rent as soon as the hot sun comes out. It travels along in spring, summer and autumn and stays put for the winter season. The holidayers are invited to live a true bohemian experience, reaching for a lost freedom; confronted with mother nature! The itinerary will vary year after year. The convoy will move according to hosting opportunities, the horses physical shape, the weather forcast etc. In 2018, the itinéray took us from north Gironde, through Charentes Maritimes to north Charentes. For the 2019 renting season, we will pass through Deux Sèvre, Anjou, Loire Atlantique to end up in Morbihan in Brittany. You will discover the vyinyeards, the convoy will coddiwomple through the rural roads passing by small villagesin the inland countryside. We made our dream come true and are willing to share it with you! We will accompany you and will help you pause your lifestyle for a while, questioning our habits and ways. 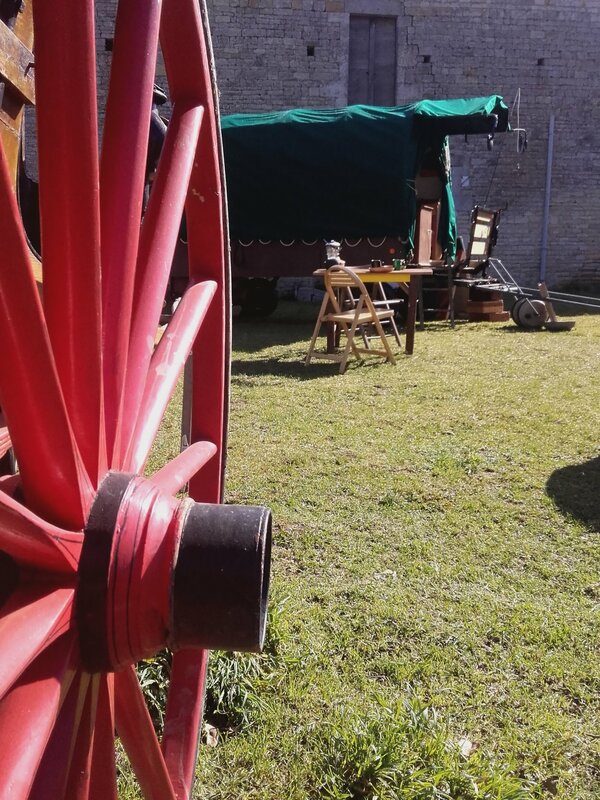 When stopping in villages for a few days, the wagons will be the décor and a great excuse to invite artists, musicians or craftsmen to join us. Wither we will organize a show, play a documentary or invite the local children, you are free to join us as much as to ride your bikes in the countryside, walk to the local market or just slowdown reading a book next to the wagons. Children as much as adults will discover a colourful universe we will enlighten you with our happy spontaneous and joyful ways. 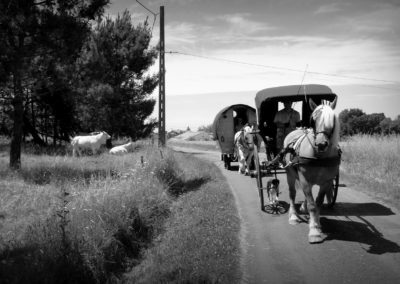 Together, let’s live a truly out of the ordinary experience, alongside the true welcoming French countryside villagers far from the clichés, diving in an authentic rural simplicity, a voluntarily simple nomadic lifestyle. Find your essential in you, discover your life source! 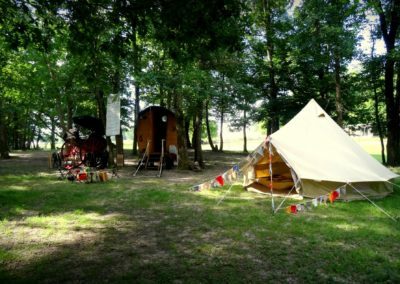 Moving the camp is an important logistical opération, it is incuded for week rentals with a minimum of 2 steps. 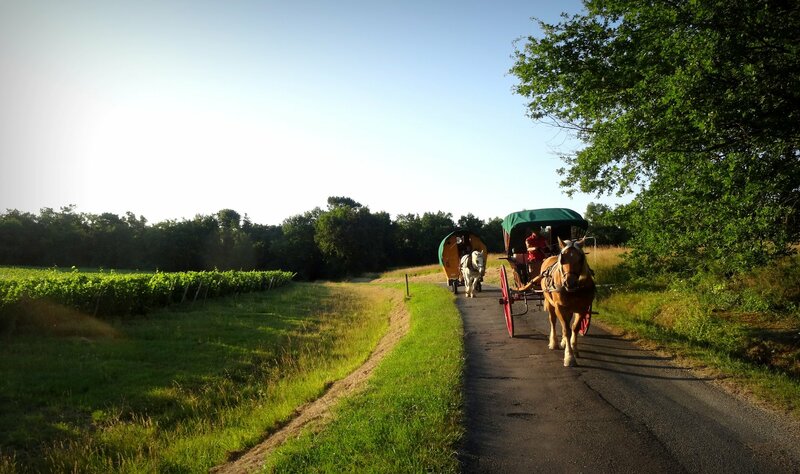 When not possible, we will propose a one hour tour with the 100 yo english carriage instead. elle es tpas belle la vie? 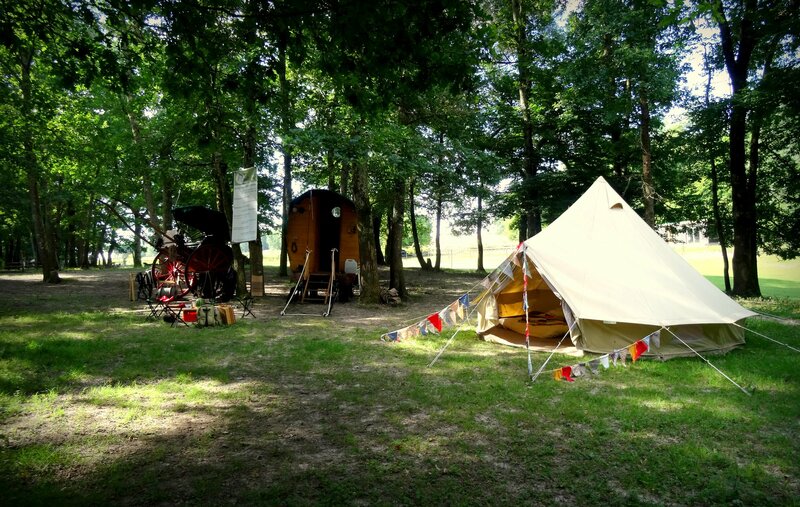 This unusual lifestyle combines a rudimentary beauty with liberating poetic form.As much as teepees, yurts or tinyhouses, the aim is to get closer to mother nature, live with the essential, the essence, nature itself.We live a nomadic life, paced by the horses. This frees us from the neverending speedy lifestyle we us to have. At 3 miles an hours, there is plenty of time to think and concentrate on what is important and dear to us. 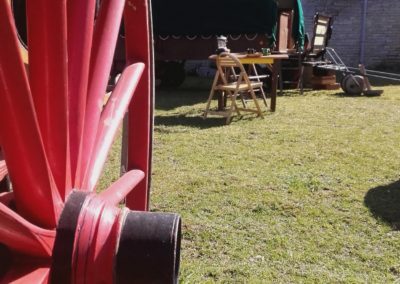 The Seahorse wagon is more than a simple guest caravan, it’s a time capsule, a moment out of time, a way to remember how things were and how they could be again. With us, your holidays will have a taste of reconnection, a live-togetherness. You will be surprised to rediscover the simple things in everyday moments. The sun beams, the fly of a bird, the voice of the fox, the children laughing will resonate like so many souvenirs you will take away with you. We confirm your reservation and contact you to match your stay with your desires. A few days prior to your arrival, you check where we are stationed. Contact us to have a precise location if needed. 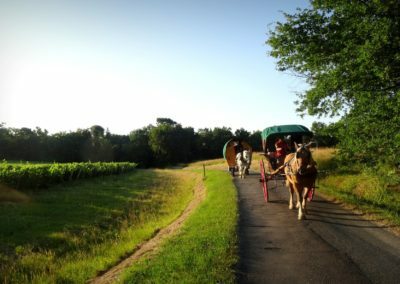 Join us by car, train, bus, bike, walking or riding your horse! For the first day, we take a little time to meet and check on your wishes for your stay. 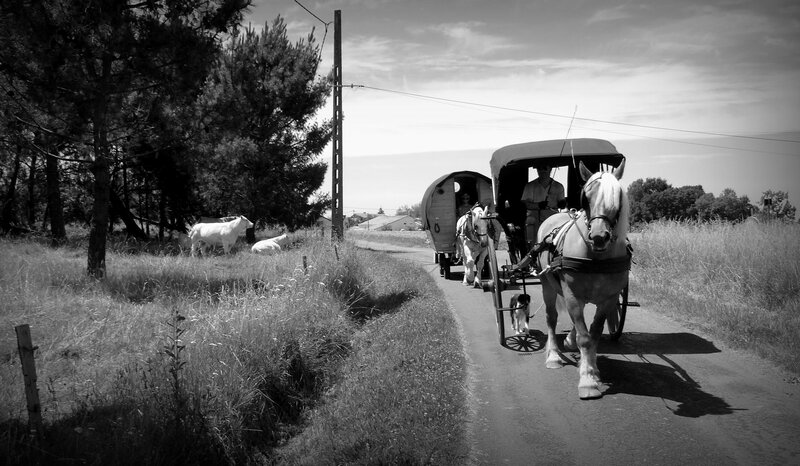 You are welcome with the basic notions of living a nomadic life as a convoy and present you to our horses. 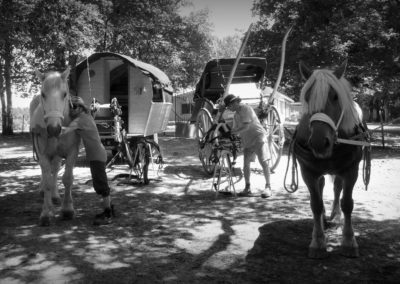 We share the days between quite moments, resting, moving with the horses, participating with th eartistic activities, circus show, children story telling etc if wanted. You plan your activities with our council and help. At the end of your stay, a cab can take you back to your arrival point or nearest transport. 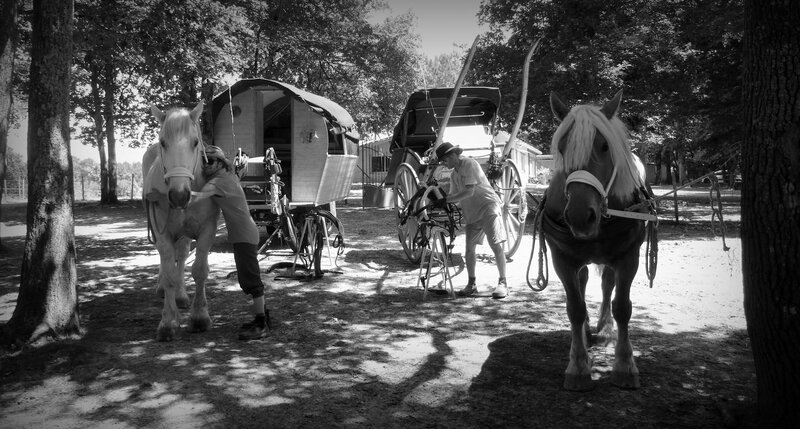 The tiny horse wagon is equiped for a family of 2 adults and 2 children max. YES, let me book a stay with you! Prepare your stay and travel light !